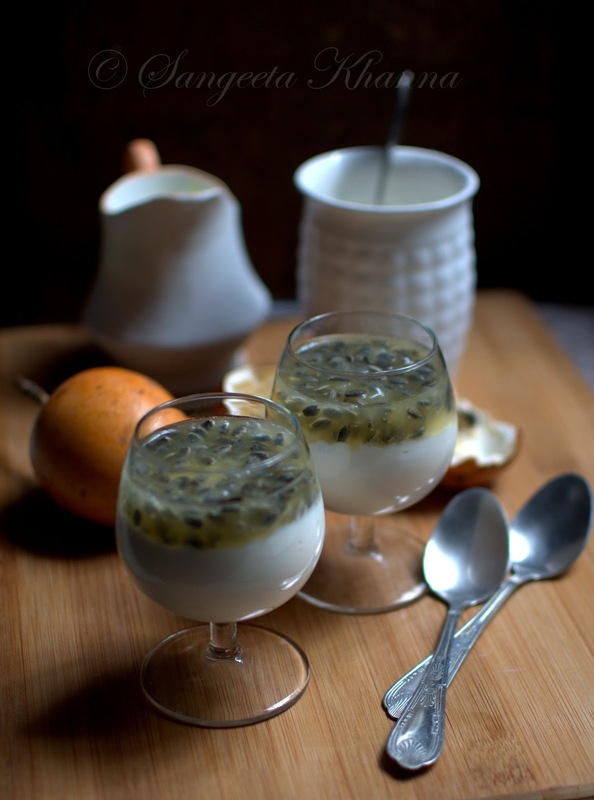 A creamy dessert with a hint of lime and vanilla topped with passion fruit pulp is something you would repeat whenever you spot some passion fruit around you. Or may be other juicy sweet and tangy fruits as well. The crunch of the seeds makes the Passion fruit much more yummier than it is for me. The pulp and juice undoubtedly are the yummiest of fruits I have tasted myself. 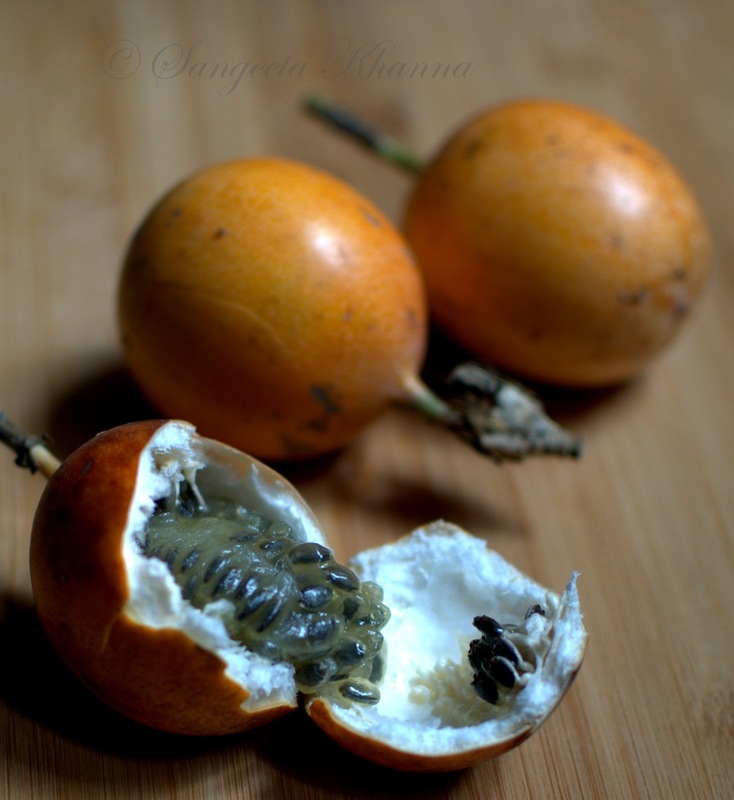 It can be light canary yellow to deep orange-yellow in color but the taste is always the same sweet tangy that explains you best why the fruit is named Passion fruit. We get Passion fruit puree in tin packaging here in Delhi, never saw the real fruit being sold anywhere. And then I found them in Panaji veggie market of Goa. Immediately bought half a dozen of them without thinking how I would carry them. My cabin luggage was a few more of such delicate things to handle. A few of the fruits cracked but the flesh was intact and as yummy as it can be. Dripping with juice. As we both like this fruit as a topping of a plain hung yogurt or sour cream, I decided not to spoil these hard earned passion fruits. The pulp and seeds will be a topping for a hung curd or sour cream based dessert for sure I thought. Tarts and cakes are not baked at home unless someone is visiting or the husband feels sugar deprived sometimes. And this time too he wanted something cake/pastry free. Good for me and very comforting to know that a very lightly sweetened dessert is what is being loved at home. I have served such desserts to friends and their kids too and I find if a dessert is packed with fresh flavors it is the best. The presence of flour/butter/sugar is just incidental as these three don't make a decent dessert together that you can enjoy day after day. Natural sweetness found in foods in their most natural form should be used in the best possible ways to make a dessert stunning. 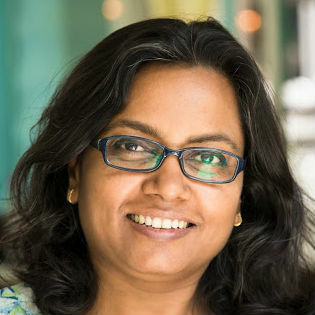 Yes, I believe a dessert should be that last course of a meal that means a happy ending, so make it happy with fresh flavors, not glum and dead with added refined sugars. Good looking serving glasses and fresh fruits have been my USP when I do desserts, there are other feel good factors than the dreaded sugar. You know what I mean..
Unspoiled, undiluted pleasure of a fresh tasting fruit is not to be missed. Bounty of nature to be enjoyed to the fullest. This recipe is very simple but requires preparation that starts a day ahead of serving. So it needs just about 10 minutes one day and another 5 minutes of assembly when you want to serve it the next day. Line a sieve with muslin, prop it inside a suitably sized bowl and pour the yogurt in it. Cover with a plate and keep in the fridge overnight. All the whey would get sieved and nice and thick hung yogurt will be ready the next day. Pour the fresh cream form the carton into a saucepan, add the lime zest and the scraped vanilla pulp and simmer on very low flame for about 5 minutes. Do not boil the cream at any point of time. Rest it for about 20 minutes and strain the cream into a bowl that you would use for whipping the mixture later. Cover and refrigerate. The next day, just mix the hung yogurt with the cold flavored fresh cream and whip after adding the powdered sugar as well. The mixture will become fluffy and light. 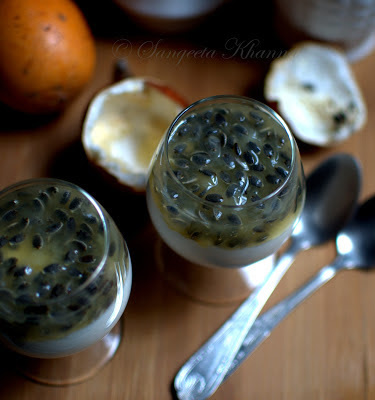 Spoon into nice looking serving glasses and top with fresh passion fruit pulp. The thickness of layers of the two ingredients can be as per taste. Refrigerate the serving glasses at least for an hour before serving. This dessert sets beautifully like a mousse. The best way to enjoy a dessert when you know everything you are having is good for you. You can top this cream and yogurt layer with mango pulp or cold strawberry coulis if you don't get passion fruit in your part of the world. Or kiwi fruits also make a stunning dessert the same way. Just keep in mind the best fruity flavors of the season, you would never go wrong with a dessert. 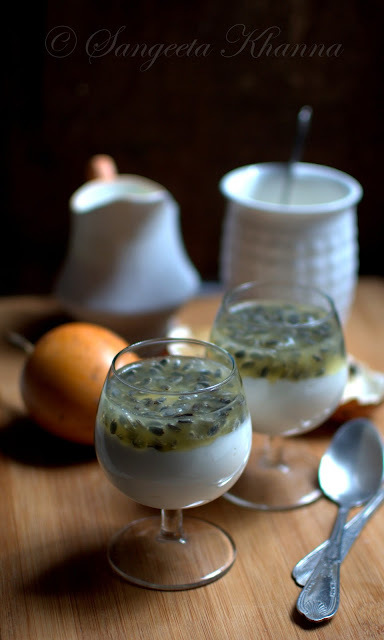 passion fruit and yogurt dessert with hint of lime and vanilla| healthy fruity desserts on the go..
Good food need not confirm to the parameters of beauty always though, I know you agree with it.